What an interesting lady Phyllis Reid is. A native from the island of Jamaica and raised a staunch catholic, by the time she was 16 she was beginning to feel torn apart. Somehow the Churches doctrine seemed at odds with Phyllis’s own beliefs. This may not sound unusual, many young people become disillusioned with the seeming contradictions that our organized religions offer. Phyllis Reid took a different view, and a different path from that taken by other disenchanted youth, she looked within for answers. In 1978 her life was once more in upheaval, the political climate in Jamaica caused her family to relocate to the United States. Here she found new challenges, for the first time in her life she had to face the realities of Racism, Racial Profiling, and maybe even more insidious, the gender gap. Her early attempts at finding a job were clearly frustrating. â€œAs a black woman how do you think,â€ and â€œFor a black woman you seem very smart and well informed,â€ my response to these questions and assertions was always, â€œMy mind is not colored, it is not blackâ€. Throughout these trials and tribulations Phylis still explored her relationship with God. Looking both inward, yet also listening and searching for outside influences. Here we are almost 30 years later, and Phyllis Reid has acquired more letters behind her name than I could fit on a business card. She has a masters in Clinical Social Work, and Honors Degree in Psychology, and a Bachelors in Behavioral Science. Not too bad for a poor little girl from Jamaica! Phyllis has never lost her love of God. She has pursued it with a passion throughout her life. She does not follow any particular religion, it is just Phyllis and her God. She draws from many religious beliefs, it is not a new church, it is just one ladies views. And they are sensible views. Maybe in this fast paced world we cannot all devote as much time to God as Phyllis does, but we can all learn a little. Anchor In The Spirit As God Beings is an interesting read, it is a book in four parts, I am sure that other people could find more exotic descriptions, but I am not terribly exotic, so I will call them, Exploration, Discovery, Acceptance, and Enjoyment. In fact I did research it, and not one single description made any sense to me! So I will stick to my own. Each section is broken up into little bite sized pieces, replete with quotes from the bible, prayers to offer, mantras, and hymns to sing, and contemplative text to think about. Phyllis does not so much offer a religion, it is more a lifestyle. She has garnered success in the inspirational speaker circuit, and I am not surprised, she clearly is a most engaging lady, but I doubt that many people have the grit and determination to walk in her shoes. You can get your own copy from Amazon. 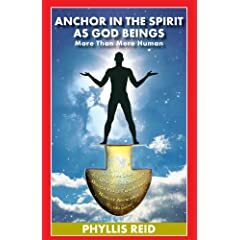 No user commented in " Book Review: Anchor In The Spirit As God Beings â€“ More Than Mere Human by Phyllis Reid "